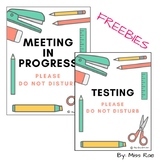 A collection of 12 Do Not Disturb Testing Signs and Do Not Disturb Learning in Progress Signs. 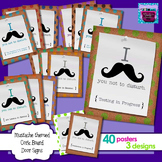 Follow Me to be notified of new teaching resources and great deals by clicking the star up at the top right by my logo. 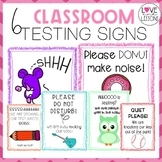 Need a sign to put up on your door(s) so that know one enters without knocking or disrupts your class while testing? If yes, this sign is for you! Just download, print, laminate or place in a sheet protector and tape it to your door when needed. Enjoy! This is the sign I place on my door during testing. Do not disturb testing sign. I have a lot of traffic coming in and out of my classroom throughout any given school day. What better way to caution your visitors than a sign to notify them that your class is testing. Directions: Print, Laminate, and Post! 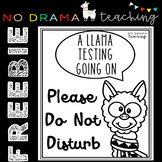 Hang this Testing Do Not Disturb Sign on your door during testing to cut down on distractions from the hallway. 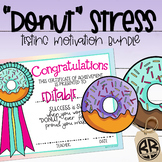 Testing Motivation Pack | Treat Tags, EDITABLE Awards, Do Not Disturb and more!